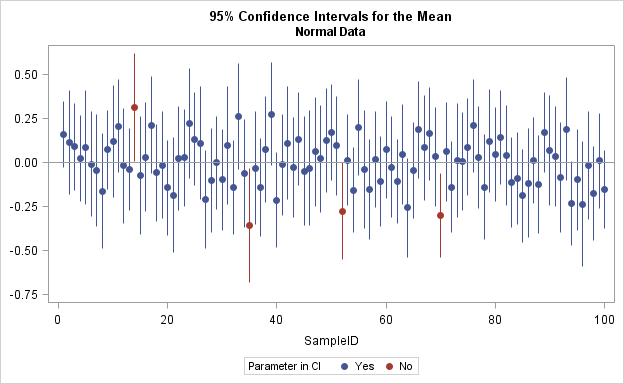 The article uses the SAS DATA step and Base SAS procedures to estimate the coverage probability of the confidence interval for the mean of normally distributed data. This discussion is based on Section 5.2 (p. 74–77) of Simulating Data with SAS. Recall that a confidence interval (CI) is an interval estimate that potentially contains the population parameter. Because the CI is an estimate, it is computed from a sample. A confidence interval for a parameter is derived by knowing (or approximating) the sampling distribution of a statistic. For symmetric sampling distributions, the CI often has the form m ± w(α, n), where m is an unbiased estimate of the parameter and w(α, n) is a width that depends on the significance level α, the sample size n, and the standard error of the estimate. Due to sampling variation, the confidence interval for a particular sample might not contain the parameter. A 95% confidence interval means that if you collect a large number of samples and construct the corresponding confidence intervals, then about 95% of the intervals will contain (or "cover") the parameter. s / sqrt(n) is the standard error of the mean, where s is the sample standard deviation. Simulate many samples of size n from the population. Compute the confidence interval for each sample. Compute the proportion of samples for which the (known) population parameter is contained in the confidence interval. That proportion is an estimate for the empirical coverage probability for the CI. The second step is to compute the confidence interval for each sample. You can use PROC MEANS to compute the confidence limits. The LCLM= and UCLM= outputs the lower and upper endpoints of the confidence interval to a SAS data set. I also output the sample mean for each sample. Notice that the BY statement is an efficient way to analyze all samples in a simulation study. The third step is to count the proportion of samples for which the confidence interval contains the value of the parameter. For this simulation study, the value of the population mean is 0. The following DATA step creates an indicator variable that has the value 1 if 0 is within the confidence interval for a sample, and 0 otherwise. You can then use PROC FREQ to compute the proportion of intervals that contain the mean. This is the empirical coverage probability. If you want to get fancy, you can even use the BINOMIAL option to compute a confidence interval for the proportion. The output from PROC FREQ tells you that the empirical coverage (based on 10,000 samples) is 94.66%, which is very close to the theoretical value of 95%. The output from the BINOMIAL option estimates that the true coverage is in the interval [0.9422,0.951], which includes 0.95. Thus the simulation supports the assertion that the standard CI of the mean has 95% coverage when a sample is drawn from a normal population. You can draw a graph that shows how the confidence intervals depend on the random samples. The following graph shows the confidence intervals for 100 samples. The center of each CI is the sample mean. The reference line shows the mean of the population. Samples for which the population mean is inside the confidence interval are shown in blue. 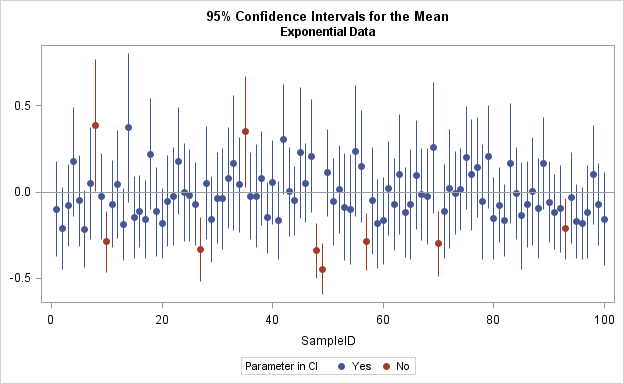 Samples for which the population mean is not inside the confidence interval are shown in red. You can see how sample variability affects the confidence intervals. In four random samples (shown in red) the values in the sample are so extreme that the confidence interval does not include the population mean. Thus the estimate of the coverage probability is 96/100 = 96% for these 100 samples. This graph shows why the term "coverage probability" is used: it is the probability that one of the vertical lines in the graph will "cover" the population mean. You can then rerun the simulation study. This time the samples are drawn from a (shifted) exponential distribution that has mean 0 and unit variance. The skewness for this distribution is 2 and the excess kurtosis is 6. The result from PROC FREQ is that only about 93.5% of the confidence intervals (using the standard formula) cover the true population mean. Consequently, the formula for the CI, which has 95% coverage for normal data, only has about 93.5% coverage for this exponential data. You can create a graph that visualizes the confidence intervals for the exponential data. Again, only the first 100 samples are shown. In this graph, the CIs for nine samples do not contain the population mean, which implies a 91% empirical coverage. You can also write a SAS/IML program. 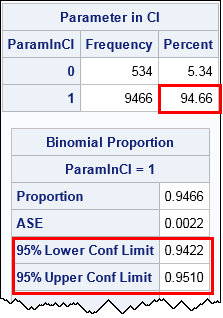 An example of using SAS/IML to estimate the coverage probability of a confidence interval is posted on the SAS/IML File Exchange. In summary, you can use simulation to estimate the empirical coverage probability for a confidence interval. In many cases the formula for a CI is based on an assumption about the population distribution, which determines the sampling distribution of the statistic. Simulation enables you to explore how the coverage probability changes when the population does not satisfy the theoretical assumptions. So I'm sure I understand, you said: "Because the CI is an estimate, it is computed from a sample." Is this the same thing as saying, "Because the CI is computed from a sample, it is an estimate?" Yes, that is what I meant. I think I phrased it that way to emphasize that a CI is not composed of population parameters (mu and sigma), it is formed from sample statistics. The SAS code did not give 95% coverage probability for each model parameter. I want 95% coverage probability for beta0, beta1, beta2 etc. I suggest you post sample data and the SAS code that you are using the SAS Statistical Procedures Community. That is the best way to ask questions about SAS procedures. 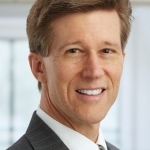 Hi Dr. Rick Wicklin, what is the recommended number of samples for coverage probability of the confidence interval for parameter of the model. Thank you. In my book Simulating Data with SAS (2013, p. 96) I say, "that is a difficult question to answer. The number of samples that you need depends on characteristics of the sampling distribution. Lower order moments of the sampling distribution (such as the mean) require fewer samples than statistics that are functions of higher order moments, such as the variance and skewness. You might need many, many, samples to capture the extreme tail behavior of a sampling distribution. A popular choice in research studies is 10,000 or more samples. However, do not be a slave to any particular number. The best approach is to understand what you are trying to estimate and to report not only point estimates but also standard errors and/or confidence intervals." how can I calculate the Probability, having Z calculated? I can't use tables as far as I'm getting Z(Confidence Intervals) from SQL querry. Are you asking how to compute the probability for a given critical value of a distribution? Use the CDF function. Suppose I simulate 1000 times and i get a coverage proportion of say 94%: how do I know what the acceptable level of variation about 95% is please? re-read the section that mentions PROC FREQ and the BINOMIAL option. If the estimate is p=0.94, then there were 940 "successes" in 1000 "trials." The estimate is a binomial proportion, so an estimate for the variance is p*(1-p)/n = (0.94)(0.06)/1000 = 5.64E-5. How do I calculate coverage probability for a nonparametric estimator of a finite population total using the edgeworth functions? particularly in R? I suggest you ask questions like this on a public discussion forum such as Stack Overflow. This is great!! What changes would I have to make in the code above to apply this to a population proportion (rather than mean)? I'm rather new to SAS and am having some difficulty. Thanks! Since you are having problems, I advise you to post your problem (along with sample code) to one of the SAS Support Communities. For statistical questions and simulation studies, I recommend the SAS Statistical Procedures Community.